Manchester United had their Premiership lead cut to two points after Alan Curbishley masterminded a famous win in his first game in charge of West Ham. 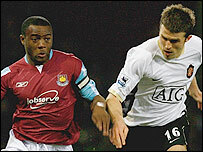 Nigel Reo-Coker tapped in late on to earn the home side victory against a United side lacking a cutting edge. Bobby Zamora had missed a gilt-edged chance for the Hammers before United's Cristiano Ronaldo had a shot saved and Ryan Giggs blazed high. West Ham endured a nervy finish as United pushed forward but they held on. 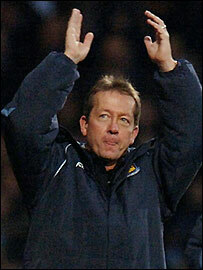 Curbishley had been all smiles after emerging from the West Ham dug-out at the start and applause rang round the ground as he was introduced to the Hammers fans. But the bubble of the vibrant atmosphere enveloping Upton Park was almost burst after only two minutes. Giggs latched on to a cross at the far post and aimed a low shot across goal that was blocked by diving defender Jonathan Spector. Spector's determination against his former club was matched by his team-mates as they showed the hunger Curbishley cited that the Premiership strugglers had been missing. The home side were almost rewarded for their efforts only for an unmarked Matthew Etherington to head Lee Bowyer's cross wide from 12 yards. Marlon Harewood sent a 25-yard strike rasping just high of the United goal before the visitors responded with a low Louis Saha shot, which the impressive Green palmed wide. West Ham refused to be dominated by their rivals and should have taken the lead when Zamora out-muscled Rio Ferdinand in the chase for a long ball. He was one-on-one with Edwin Van der Sar, who correctly chose to dive to his right and saved as the home fans prepared to erupt. United were lacking the penetration and creativity in the final third to split the stubborn Hammers and Green was equal to Saha again when the striker tried to squeeze in a long-range effort. The visitors were under pressure to produce a result following Chelsea's win over Everton but were growing increasingly frustrated as the game wore on. West Ham then had Green to thank for keeping them level when he turned an angled Ronaldo shot round the post before Giggs blazed high from 10 yards. The new manager syndrome so often inspires a team to new heights and it proved the case for West Ham as the much-maligned Reo-Coker struck. Former United striker Teddy Sheringham found Harewood, who pulled the ball back from the byline for the on-rushing Reo-Coker to tap in from close range at the near post. The win, Curbishley's first over United as a manager in 16 attempts, failed to lift West Ham out of the bottom three but Upton Park was full of hope at beating the drop after the final whistle. "There has been a lot of criticism of the players and they've got to answer that and face the music. "We had the first training session on Friday and they responded. Now we've got something to build on." "We have been throwing away lots of chances recently and this was another example of that. It's something I've spoken about with the players over the last few days. "I'm not so sure Chelsea are on a charge. They got a fantastic win where they've clawed it out of nothing (at Everton). "We've got to put on a charge of our own, which is the stuff champions are made of, and we've shown we can do that. "The Championship race wasn't going to be decided in December but I'm happy with the form of the team and we're playing well." West Ham: Green, Spector, Ferdinand, Collins, Konchesky, Bowyer, Reo-Coker, Mullins (Benayoun 71), Etherington (McCartney 77), Harewood, Zamora (Sheringham 59). Subs Not Used: Carroll, Tevez. Man Utd: Van der Sar, Neville, Ferdinand, Vidic, Heinze (Park 88), Ronaldo, Carrick (O'Shea 84), Scholes, Giggs (Solskjaer 73), Rooney, Saha.